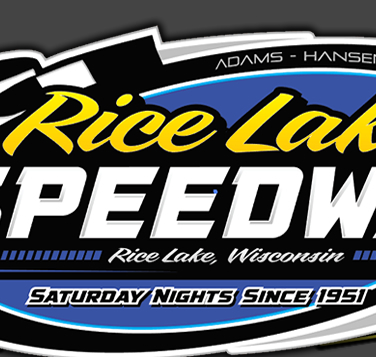 RICE LAKE, WI (July 3) - Before possibly the largest crowd in the three years that Adams-Hansen Inc. has owned the Rice Lake Speedway, Kevin Adams, looking the strongest he has during the 2014 racing season, won the Modified feature and then doubled up on his pleasure by also winning the makeup feature in the Modifieds left over from last Saturday night’s rain shortened program. Other winners at the Firecracker special were Willie Johnsen Jr, Nick Koehler, Scott Clark and C.J. Wagner. 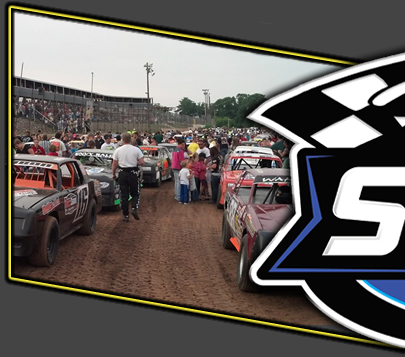 One hundred and twenty eight race cars from three states signed in to race Thursday and the large throng on hand was treated to a twenty six race program. Adams bookended the night by winning the first and last events on the racing program. The makeup feature was the first event of the night and Adams would come from the fifth starting spot to take the win in a nonstop race. Steve Hallquist led much of the first half of the race after having an early battle with Dave Baxter for the top spot. Adams moved to third and then fought several laps before he was able to get by Baxter also. He closed on Hallquist and they raced hard side by side for a couple of laps before Adams was eventually able to edge into the lead. With the race staying under the green flag, Adams widened his gap over the field as Mike Anderson moved up from eighth to challenge Hallquist for second. As Adams drove home for the win, Hallquist held off Anderson for second in earning his best finish of the year to date. Scott Miller also had a strong run as he finished fourth ahead of point leader Mark Hessler. A full field of twenty four cars took the green for the second Modified main with Anderson starting on the pole and taking the early lead as he edged away from Hallquist. Cory Mahder started in the second row but he was on the move as he passed Justin Ritchie and then Hallquist to take over second. Adams started seventh on the grid and also moved forward quickly, getting by Paul Brust and Pat Hoffman on the low side and moving in to challenge Zach Drews for position. Adams was able to race past Drews for third and he then set off after the leading duo of Anderson and Mahder. The yellow flag waved one lap short of the halfway point and this bunched the field. Adams moved to the high side of the track on the green and found immediate success on a part of the track that no one seemed to be running. He drove past Mahder for second and then closed on Anderson. With a strong run off turn four, Adams drove past Anderson to take over the lead. As Adams started to pull away, Mahder also moved to the top and he was able to drive past Anderson for second. The rest of the race saw the top three run in that order, with no changes. Drews, making his first start of the year, finished a strong fourth while Curt Myers came from fifteenth to complete the top five. The wins were Adams’ second and third of the year at the track in 2014. Kevin Burdick was the early leader of the Super Stock main event with pressure coming from Gunnar Watkins and Johnsen Jr. Willie found an opening and slipped into the lead and started to put a little distance on the field. The battle for second was intense as Watkins fought with Jason Forehand, Burdick and Andy Davey for the position. Forehand and Watkins had a pitched battle for second with Jason eventually able to slip into the position. Johnsen Jr was running a strong race and no one was able to close in on him, until a late yellow, the first of the event, set up a three laps dash to the checkered. Johnsen Jr got away well on the start, and opened up a couple of car lengths on the pack. The battle remained heavy for second but Forehand was able to hold on to the spot with Davey stealing third from Watkins on the last lap while Burdick completed the top five. For the track point leader Johnsen Jr, it was his first ever feature race win at Rice Lake. Koehler led from start to finish to earn his first Midwest Modified feature win of the year at Rice Lake. The win was anything but easy though, as he had to fight off several challenges for the lead. As Koehler edged into the lead early, he was pressured heavily by Cole Spacek who raced to his inside. Later in the race, Nathan Thums moved to the high side and temporarily raced into second and then nearly got past the leader. While these battles were taking place, the driver on the move was Ryan Viltz who had started in the fourth row. Gradually working his way to the front, he got past Thums for second and then closed in on Koehler. Viltz gave it all he could as he pushed the cushion in the late going but while he got to within a couple of car lengths of the leader, Koehler held his line and drove home for the win. Spacek made a late burst that saw him nip Thums for third at the line and Mickey Nosser completed a great run, coming from fifteenth to fifth at the finish. Clark and Ron Hanestad spent the vast majority of the Street Stock feature racing side by side and it wasn’t until the last lap that the decision was finalized. Hanestad started on the pole and took the early lead but he was challenged first by Simon Wahlstrom and then Clark. Clark pulled to the inside of Hanestad and that was the way they ran for most of the fifteen laps. Clark was ahead by about a car length but Hanestad would get a good run off the high side and then pull back up beside Clark. They continued this pattern as the laps ran down with Wahlstrom just behind them and Jimmy Randall using the high side to try and catch them all. Down to the wire they raced in the same pattern and while Hanestad had a good run off the top side on the last lap, Clark had just enough momentum to fight him off by a car length for the win. Wahlstrom had his best finish of the year as he finished a solid third with Randall coming in behind him and Adam Soltis nipping Kirk Bogdanovic on the last lap to complete the top five. For Clark, it was his first Street Stock win at Rice Lake since the 2009 racing season but the forty third of his career at Rice Lake. Wagner would take his second Pure Stock feature win of the year in a wild race that saw the yellow wave several times. Rob Grabon took the early lead and led the first few laps with John Erickson, Jason Havel and Wagner all challenging him. Havel moved into second and dove to the inside of Grabon, but he almost spun and dropped back a couple of spots. Wagner and Erickson then battled for second as both closed on the leader. Havel’s night would come to an end when he spun in turn four and was clipped by another car, damaging his front end. On the restart, both Erickson and Wagner would get by Grabon and they had their own battle for the top spot, with Wagner taking control. Grabon’s night would come to an end when in a three wide battle for position, cars would touch and Rob’s car would suffer a flat tire, ending his night. Wagner continued to lead but Hunter Van Gilder would be on the move and he drove past Erickson in the late going for second. Van Gilder tried to catch Wagner at the end but C.J. drove home for the win. Erickson settled for third as he held off Joel Hinrichs and Jimmy Holden had his best finish of the year, completing the top five. There will be no racing at the speedway this Saturday, July 5. The next event slated for the track will be on Saturday, July 12 and it is another big one. 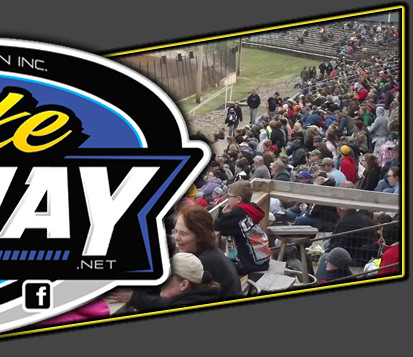 The annual visit of the Interstates Racing Association (IRA) winged sprint cars will be on that night and defending point champion Billy Balog will lead a group of twenty to twenty five of the winged warriors to the speedway. There will also be a full program in all other classes that normally race at the speedway except for the Modifieds that have the night off. There will also be one extra race as the Super Stock feature race from June 28 that was postponed by rain will also be held that night. Race time is slated for 6:30 p.m.